An illegal dump blamed for a massive fly infestation has been cleared of all waste. 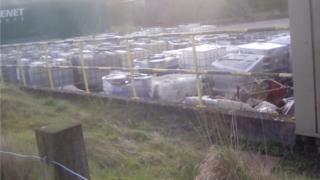 More than 1,500 tonnes of chemicals and mixed waste were found at the former Netherplace Dye Works near Newton Mearns in April. The Scottish Environment Protection Agency (Sepa) worked with East Renfrewshire Council on the clear-up. Sepa now says work at the site, which had been leased to a tenant by the landowner, has been safely completed. People living close to the area first complained in March about a large number of flies affecting homes and businesses. The infestation also caused problems in neighbouring Clarkston and Giffnock. Residents were warned that it would "take time" to deal with the problem. Sepa has called for landowners to show greater vigilance in tackling waste crime. Spokesman Kenny Boag said: "The full and final clearance of waste from the former Netherplace Dye Works is great news, and will be warmly welcomed by the local community, which suffered greatly as a result of the illegal waste stored at this site. "Organised waste crime impacts not only the environment, but communities also and Sepa will respond vigorously to those who dump in this way. "Our advice to anyone who owns or rents vacant space is to carry out thorough checks on prospective tenants and stay vigilant, as this sort of illegal activity could happen to you. "Abandoned or derelict sites, similar to the Netherplace Dye Works, are a prime target for criminals as they can disguise illegal activities under a mask of legitimate works such as construction and renovations. "With illegal stockpiling on an industrial scale on the rise this is a strong reminder to owners to keep an eye on their land and not allow potential criminals the opportunity to turn a quick profit at your expense."